The person-centred care promoted at Barchester has helped their senior care assistant Peter Crabb, in his first year of study as a student nurse. Each year thousands of people decide to dedicate their lives to the care of others by becoming a nurse. Every April, the talent of these special people is showcased at the Nursing Times Student Awards which celebrates student nurses and all those who provide the support required to train them. As part of its commitment to continual professional development, Barchester Healthcare has been helping some of its own staff to become nurses. Barchester has been offering senior care assistants the opportunity to become a nurse through an Open University (OU) degree, which provides those who are already working the ability to study, train and work at the same time. 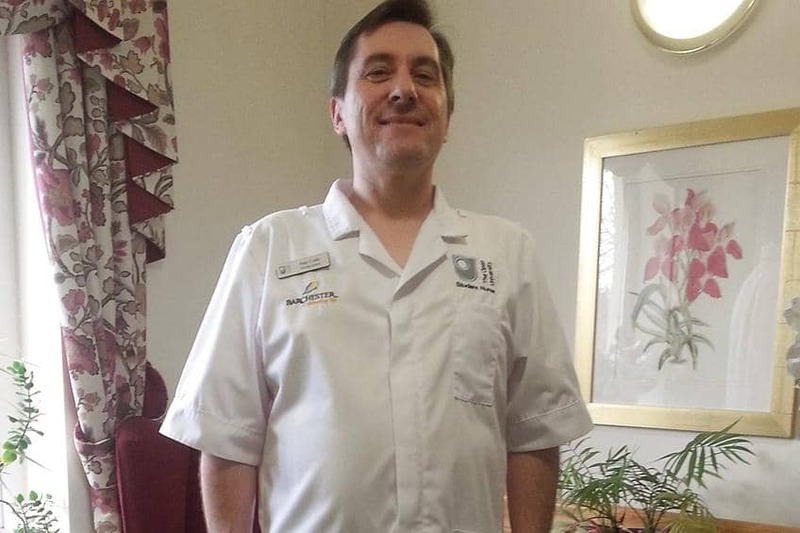 Peter Crabb, Senior Care Assistant at Barchester’s Westlake Care Home, is in his first year of study, but has been working as a care assistant for over 20 years. “It started when my wife and I went to Canada to work with people living on the streets. Though I had done care work before, helping make a difference to people’s lives made me realise I wanted to do this type of work as my career.” On his return to the UK Peter was employed at Westlake and has never looked back. “My family know that becoming a nurse is what I want to do with my career and have been fully supportive, but it’s the support I’ve received from other areas of my life that has really helped me achieve my goals.